The 11th South Suffolk Classic run is taking place on Sunday 12th May. Full details of the event, including route details, regulations, entry forms and online entry are available from the event website www.southsuffolkclassic.co.uk. It’s just 4 weeks away and things have developed nicely here is an update please spread the word. 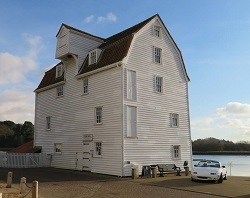 Woodbridge Riverside Trust will be opening their Longshed boat workshop adjacent to the start extra early on the morning so you can view the replica long boat, Sae Wylfing and have a look round whilst waiting for the start. Complimentary tea or coffee will be available at the start from the Coffeelink, outlet pastries and bacon butties will also be available. Bentwaters Park is up and running – Bill Kemball has roped in this wife and daughter for the day to ensure the museum exhibits and tour is viewed at their very best – there is also the chance of one of the stationary engines being up in ‘steam’. Bentwaters, besides having a WW2 history, remained as a USAF base until relatively recently and was a prominent Cold War Nuclear resource. Upon release by the MoD it was purchased by Bill Kemball and has developed into several areas including agriculture, energy production, storage and other industrial uses. Part of our visit will be a guided coach tour around the various facilities which will last about an hour. Nick and I have had the tour and it is completely fascinating. The Kemball family are also very keen on equipment and history and there are three 'museums' contained in some of the original base buildings. Bill Kemball has a collection of Agricultural machinery pre-1960 which is of national if not international significance, not normally open to the public. The content is jaw-dropping. Mrs Kemball has a unique collection of ladies dresses from each decade from the 1900's to the 1960's including many spectacular bridal gowns, which impressed me, even as a devout male who likes things made of metal! They are also working on a new exhibition of WW2 life and another relating to the Holocaust. You will gather that we thought it sensible to shorten the road mileage this year in order that you get a better chance to take in everything Bentwaters and the Kemball family have to show you. This will be the best SSC yet. A portion of your entry fee is being donated to two local charities East Anglian Air Ambulance and Wantisden Church Roof. The good news is that Wantisden Church now has the funds for the new roof work so Bentwaters Park have changed their nominated charity to Ipswich Hospital Blossom Appeal (Breast Cancer).